Search for runners knee treatment on the internet and you'll be bombarded with lots of advice and suggestions, some good and some not so good. Generally runners knee is treatable and there is lots that you can do yourself to get it sorted. Before you can pick the correct runners knee treatment though, you do need to know what caused it in the first place. Runners knee (also known as Patella Femoral Syndrome), accounts for around 25% of running knee injuries and is caused by an abnormal movement of your knee cap (also known as your patella) which then causes friction on the knee joint itself. However runners knee is not just something that runners get as anyone who does a lot of knee bending such as cyclists, people who kneel a lot, gardeners, walkers and so on can suffer from it. What causes abnormal patella movement? Muscle weakness or tightness around the knee. Weakness in your front thigh muscles (quadriceps). Running usually strengthens your back thigh muscles (hamstrings) more than the front. This leads to an imbalance if you don't do strength training to correct it. Malalignement of any bone(s) from your hip down to your feet, perhaps caused by an injury, weak muscles or just favoring one side of the body more than the other. Weak hip muscles, often in women. This contributes to poor running form and hence altered knee movements. Imbalance or instability in the way that your feet strike the ground. Perhaps you have flat arches or you over or under pronate. How to choose the correct running shoes. Running on a sloped surface or a curved track. All that turning and tilting creates more pressure on one side of the body. Trauma to the knee from a fall of a blow. Other causes of knee pain. A dull pain around or behind the knee cap. The pain comes and goes and is worse when you start moving your knee after inactivity such as sitting in chair for a while, getting out of bed or the car. Pain in front of, behind or around the knee cap. Knee pain on going downstairs or downhill. 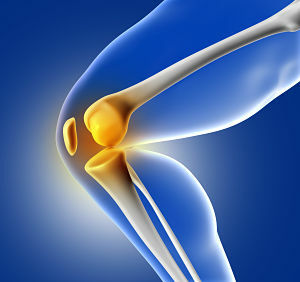 Possible popping, grinding or grating sounds (known as crepitus) or swelling inside the knee. Your main aim with treatment should be to reduce the pain, reduce any swelling and then to deal with the cause which in most cases is a muscle imbalance. The good news is that runners knee rarely requires surgery and in fact responds very well to thigh, hip and knee strengthening exercises. It can take up to 6 months for things to totally settle down but it can take longer if you don't properly address the issues that caused it in the first place. Rest your knee as much as possible if it is painful. Rest or reduce your running time a lot for a few days and then see if it improves. If it does, very gradually start to increase your time running. Don't overdo it or you'll never let it heal! Ice your knee for 10 - 15 minutes twice a day after activity or if it is swollen. How to ice correctly. Start strengthening any weak muscles. In fact regular strength training should be a normal part of your running training - I know it is sometimes hard to get motivated with it! You can find lots of free exercises on the internet but if you want something a bit more structured then I personally recommend these strengthening exercises. They have helped me enormously as I have weak hips which in the past has lead to various knee and ankle problems. Avoid sitting in one position for too long. Get up and walk about every 30 minutes. This will help alleviate any stiffness. Check your running shoes and see if they need changing. If you are unsure get advice from a running shoe shop. How to choose running shoes. Give support to your knee by using kinesiology tape. I am a big fan of taping and it has saved me a in a few situations. There are some big brand name (and expensive) tapes out there but personally I have found a good cheap brand which I bought on Amazon and I am really happy with it. Here's the link for the kinesio tape on Amazon.com and Amazon.co.uk. Below is a video showing you how to tape your knee.